(...continued from part 5) Biodynamics aside, what about the wines? In short, they’re great – I’d count this among one of New Zealand’s top estates. 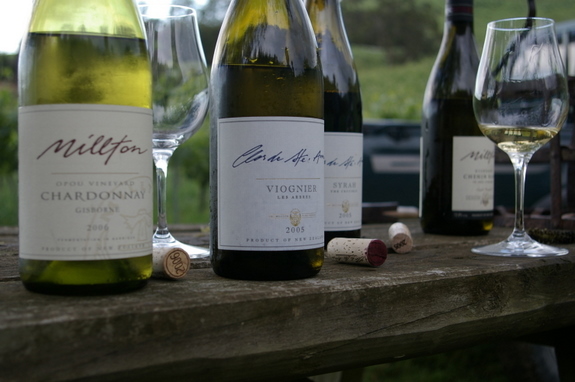 What is remarkable is the sheer diversity of varieties that Millton seem to be able to get to work here, ranging from Syrah, to Riesling, to Pinot Noir, to Chenin Blanc. The first set of notes are those from the visit in Novermber 2007; the second set are from a tasting in London with UK agent Vintage Roots in March 2008; the third are from a more recent tasting in June 2009.
temperatures of 70 degrees Centigrade are reached. I caught up with James again in London on a recent visit to try his latest releases, along with Peter Gordon at the Providores restuarant.